Oops… I Bite it Again! A bite splint is a plastic device that is fitted to the teeth to reduce, or even prevent, the pain associated with bruxism or clenching the teeth. It may also be called a mouth splint, mouth guard or Mandibular Advancement Device. Bruxism is the technical name for clenching or grinding of the teeth. While some people with bruxism experience no adverse results, others do develop problems ranging from pain and discomfort, through hypersensitive teeth, to wearing down the tooth surfaces. Headaches and earache may also commonly be associated with bruxism. 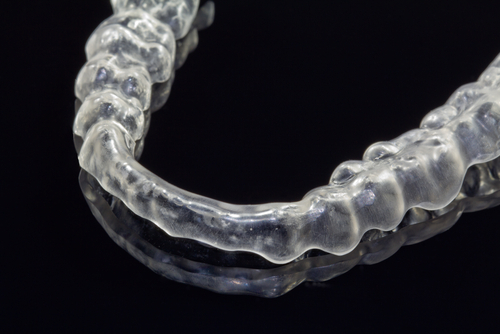 Research suggests that around 80% of bruxism is subconscious and happens during the night. This can contribute to identification of the problem because normal daily activities like talking and eating are not affected by bruxism so it can be difficult to ‘spot’ as we’re not awake when we do it! Stress and anxiety are considered to be a key feature of bruxism in most cases and many people develop stiff jaws and shoulders, sleep disruption and facial muscular pain (facial myalgia) without being fully aware of the original cause of their symptoms. Dental intervention can establish whether bruxism is a factor. Dentists at our London-based Alkali Aesthetics dental studios are committed to recognising the symptoms of bruxism and helping patients avoid its long term effects. They focus on causes of ‘referred pain’ – in other words pain experienced in an area of the body not associated with the original cause. Why not make an appointment now to explore whether bruxism might be affecting your health? Why might you need a bite splint? >To extend bleaching treatment options. What is the procedure for fitting a bite splint? Following a dental check up at our Putney dental studios, an impression of the teeth is made and a custom made splint is created. Then the dentist will fit and adjust the splint and advise you how often to wear it for optimum results. Follow up appointments ensure the bite is reassessed and the splint adjusted as necessary. What is the cost of a bite splint? The cost of a bite splint depends on how strong the splint needs to be. Costs start at £180.00 – a small price to pay for reducing pain and ensuring the long term health of your teeth.